On Monday my Mum and her friend Sandy came down to Toronto and the three of us headed to the Canadian National Exhibition (also known as the CNE or the Ex). Mum and I go every year and Sandy has been with us once before - it's basically a huge fair with vendors, animals, food, demonstrations, contests, games, and rides. We never go on the rides (I've only been on some - the year my Grandpa and I went together) and rarely play any games but we do a lot of shopping, eating, and catching up with the alpacas, cows, sheep, and horses. I was very disappointed since it appears that they no longer have the quilt exhibit - I couldn't find it last year and didn't find any mention of it on the website this year. However there was a Lucy Maud Montgomery exhibit (which I've actually seen before) so I was pretty happy about that! Unfortunately I don't have any pictures from that day since my Mum and Sandy were taking pictures but we had a good time! My Mum's birthday a couple of weeks ago but I didn't see her until she came down so I gave her her presents while she was here. I made her a little tote for carrying stuff around - I thought she could use it for books but she may end up using it to take her lunch to work, hehe! I did put a book in the bag though - the new Kathy Reichs novel Flash and Bones which is the latest book in the Bones series (the TV show was based on it) which my Mum really likes. I wanted to get her the newest Jeffrey Archer novel, Only Time Will Tell, (he's her favourite) but when I went to store I was told that they had three but weren't allowed to put them on sale until the day after I needed it - ugh! 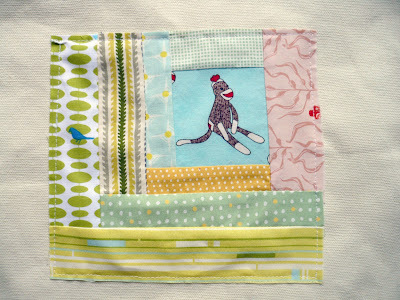 My Mum collects sock monkeys so I've made her a few things over time incorporating some of this Erin Michael fabric - she just loves it! I'm having some problems with my sewing machine and don't have a usable walking foot at the moment (which I'll tell you a little bit about in a minute) so sewing the block to the tote didn't go perfectly but I think it's cute! 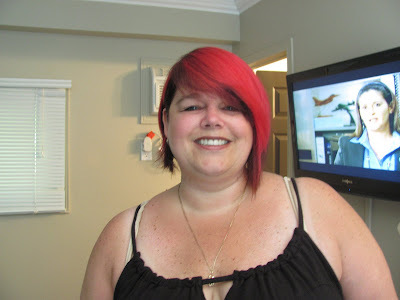 I dunno if my Mum will be okay with this but I wanted to show y'all her new haircut! Hi Mum! Yup, that's my Mum! She was a young'un when she had me - that's for sure! Isn't her new hair pretty cool? On top of having a full-time job and a part-time job (she is apparently bored without me at home to keep her on her toes) she is also a hair model for Paul Mitchell. She will basically let them do anything to her hair - I think it's really fun! 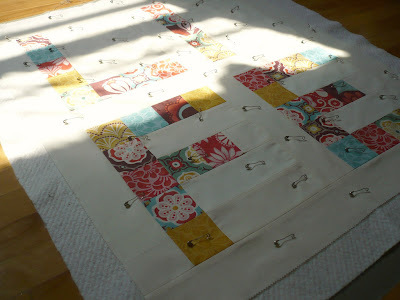 My walking foot exploded and spilled what looked like dried oil on to the quilt top - ugh! I guess the walking foot didn't really explode so much as the plastic part holding it to the shaft of the machine splintered sending plastic flying at my face (I'm okay though) and rendering it unusable. This is actually the second time that this has happened to me so, having spoken to a Janome dealer at the CNE, I am going to get a new one made by Janome that has metal clips that hold it to the machine. And no worries, after much fretting and worrying the oil did clean off the quilt top! 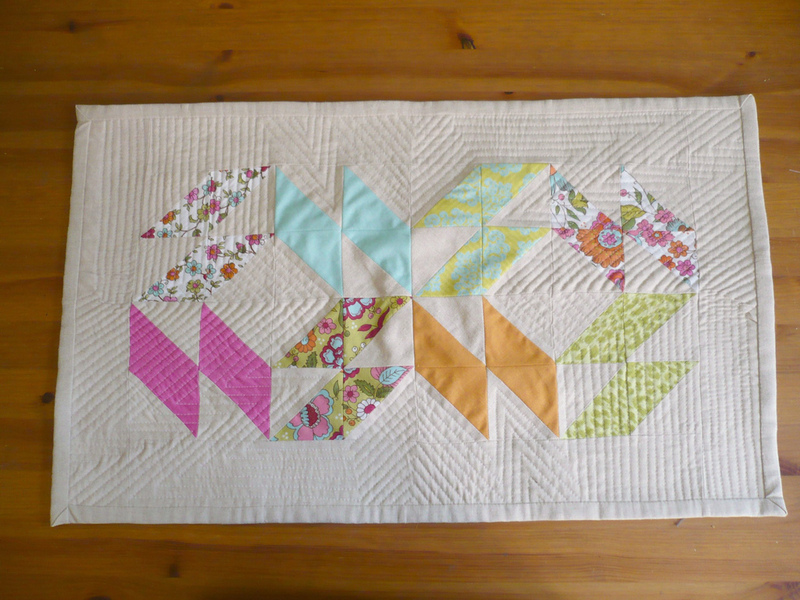 *sigh of relief* The quilt above is part of a special project I'm working on for a friend's mum but I'll tell you guys more about that when it's completed. Also, I'm going to be destashing some more of my fabric collection in my shop on Etsy (and putting the money towards having my machine serviced) but wanted to tell you guys about it first - I have some West Hill, Mendocino, Flea Market Fancy, 1974, more Heather Ross, and others that I'll be putting up for sale so if anyone wants to claim anything before I get it up just send me an email and I'm sure we can work something out! 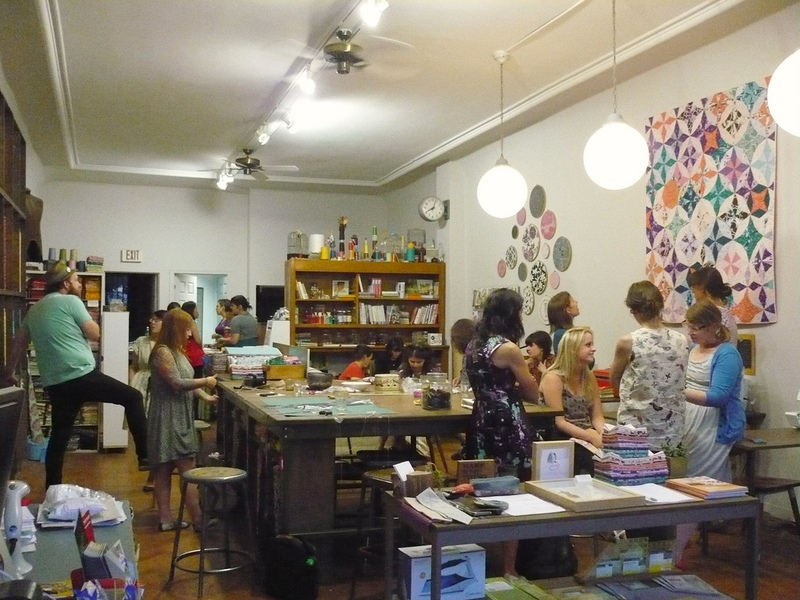 On Tuesday night I headed to The Workroom to welcome a very special visitor to Toronto - Lizzy House! 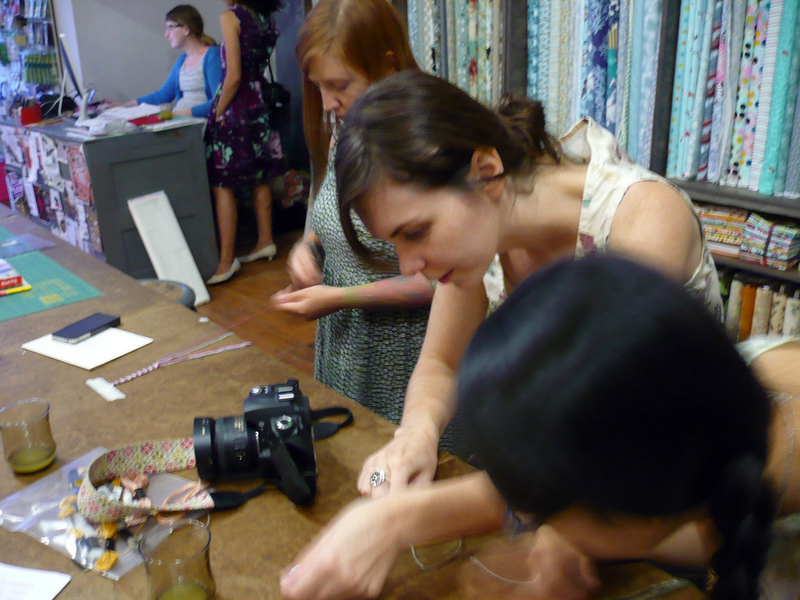 That's right Lizzy is here in "the T Dot" for a week teaching some workshops at The Workroom and on Tuesday Karyn hosted a friendship bracelet making party in her honour. I picked up some Cosmo floss at the store (which can also be found in The Workroom's online pop-up shop) and Karyn gave a little demonstration on how to make a chevron-style bracelet. My attempt is seriously all kinds of janky - maybe this is why I didn't have any friends in grade school - but I'm going to try again. Practice makes perfect as my Mum just said to me on the phone! 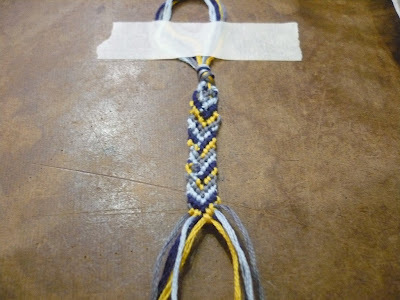 I think I'm going to try using just two colours the next time and I'm going to focus more on creating tight even knots. Other people were working away diligently and were really getting the hang of it! Here is the lovely Katherine of Carolyn and Me - the colours she chose for her bracelet were really gorgeous and her bracelet was coming along like gangbusters! As the friendship-bracelet-making continued some people began milling around, chatting, and admiring Lizzy's beautiful Diamond Mountain quilt displayed on the wall. 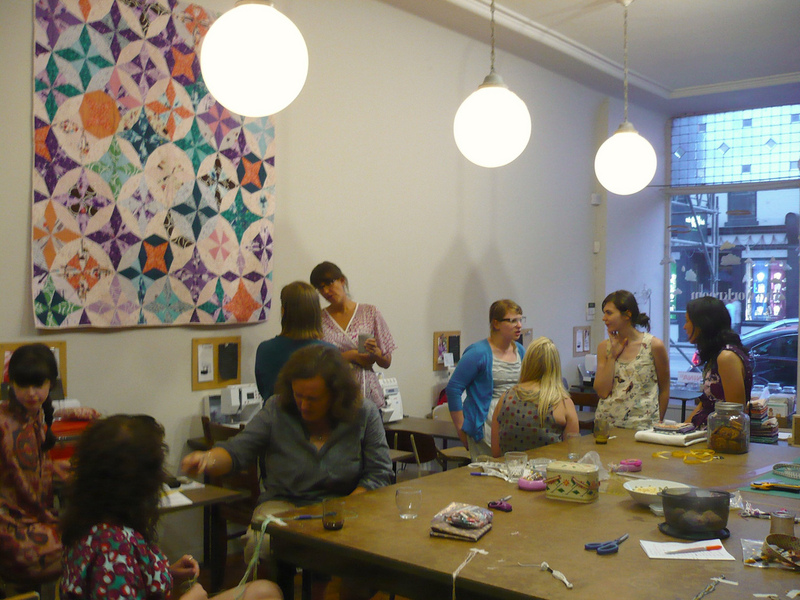 Lizzy is in the blue cardigan, and there's Katherine again, Karyn's in the purple dress (which she made using Drop Cloth in Plum from Jay McCarroll's Habitat collection), and there's Jacqueline of Soak fame too! 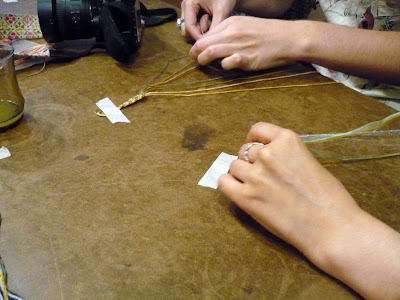 I was still working away on my friendship bracelet trying to get at least a few good chevrons, but alas (as you can tell from the above "janky" photo) it was not to be! 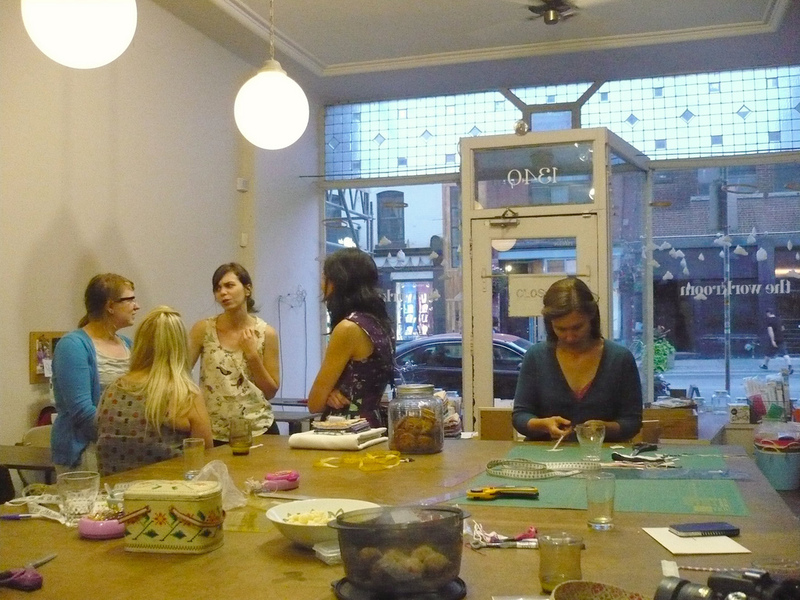 From my perch at the end of the cutting table I had a good view of all the fun going on around me and a container of my mini-muffins within arms reach! At least I had Lizzy's gorgeous 1001 Peeps right behind me to pine after and console me for my woeful lack of friendship bracelet skills! If you are in or near Toronto and would like to take a workshop with Lizzy at The Workroom I do believe that there is still room in her Champion Ribbons class which takes place on Saturday - I would absolutely love to take this class but unfortunately I've got to work on Saturday! 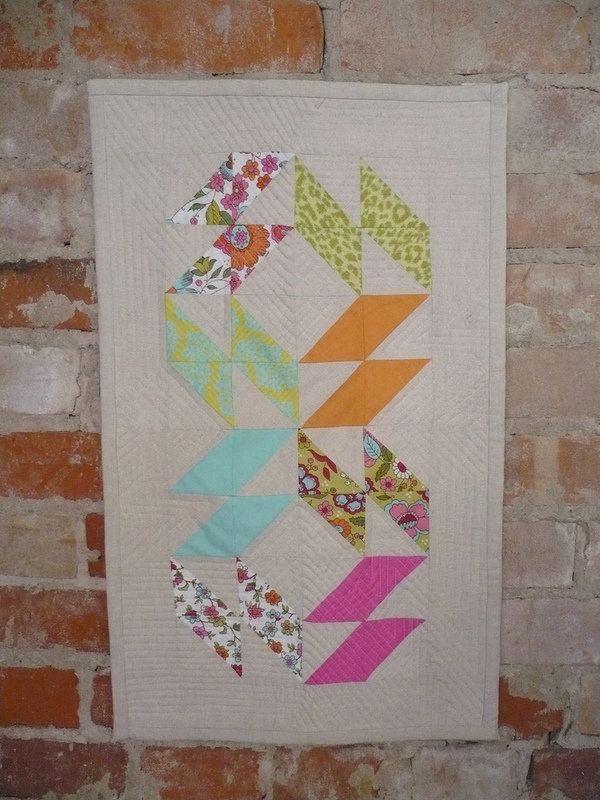 However, I will be heading back to The Workroom on Sunday to preside over this month's Toronto Modern Quilt Guild meeting - fun fun! 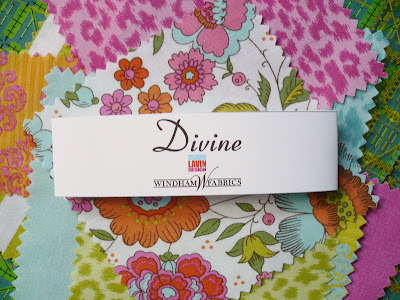 When the new Divine fabric by Rosemarie Lavin arrived from Windham a couple of weeks ago I decided that it was the perfect opportunity to write up a small tutorial that I had been thinking about - so here it is! 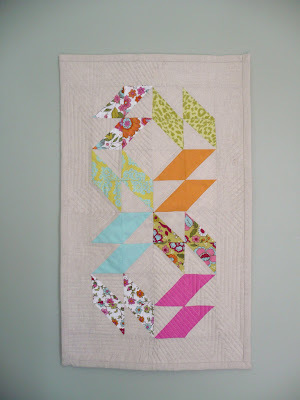 This little mini can be used either as a tabletopper or as a mini quilt with the addition of some hangers on the back (here's a great tutorial from Aneela on adding embroidered hanging loops to a quilt). Okay, are you ready? Let's go! *All seams are 1/4" unless otherwise stated. 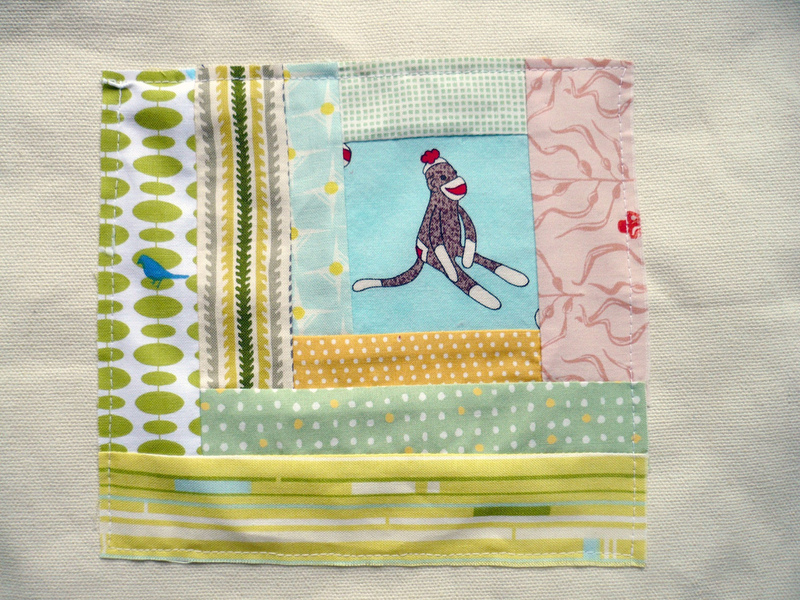 From your Essex fabric cut eight 5x5" squares, two 3"xWOF strips, and two 2.25"xWOF strips for binding. 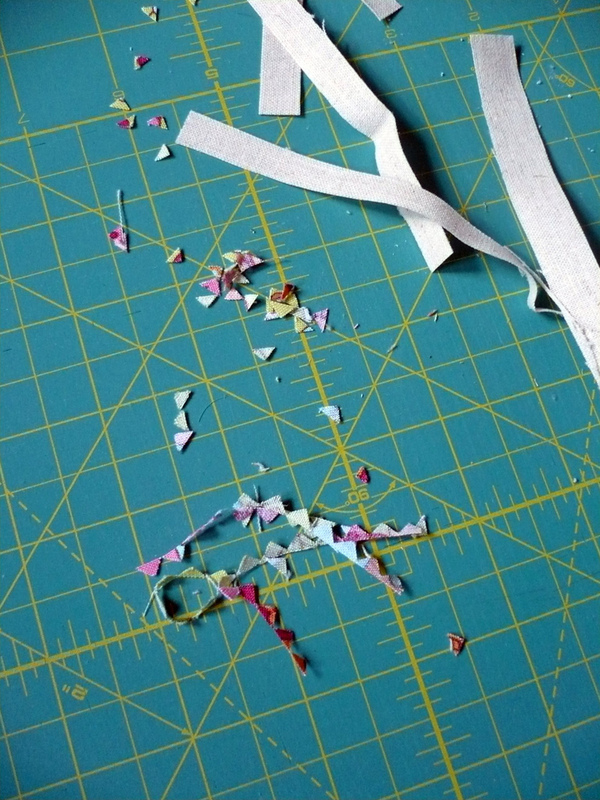 I like to cut my binding strips at 2.25" but feel free to cut them at whatever width you like. 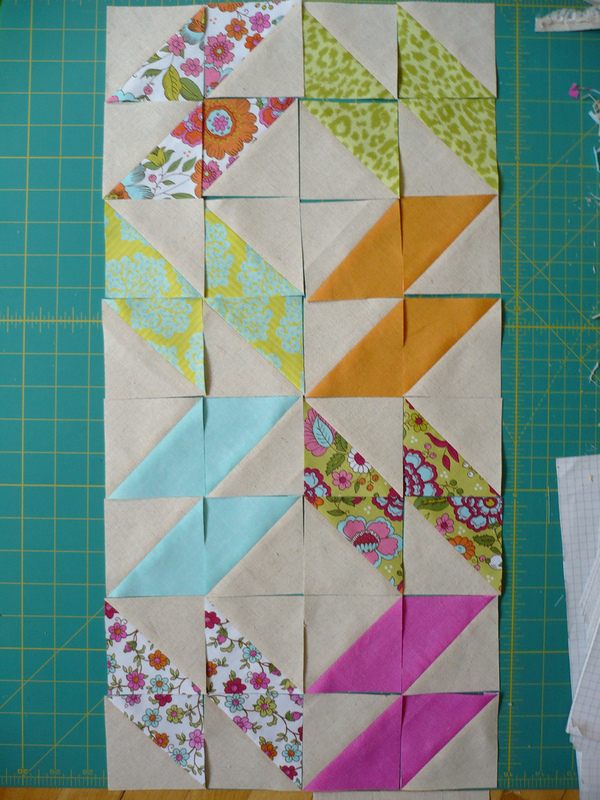 Subcut the 3"xWOF strips into two 3x20.5" strips and two 3x15.5" strips for borders. 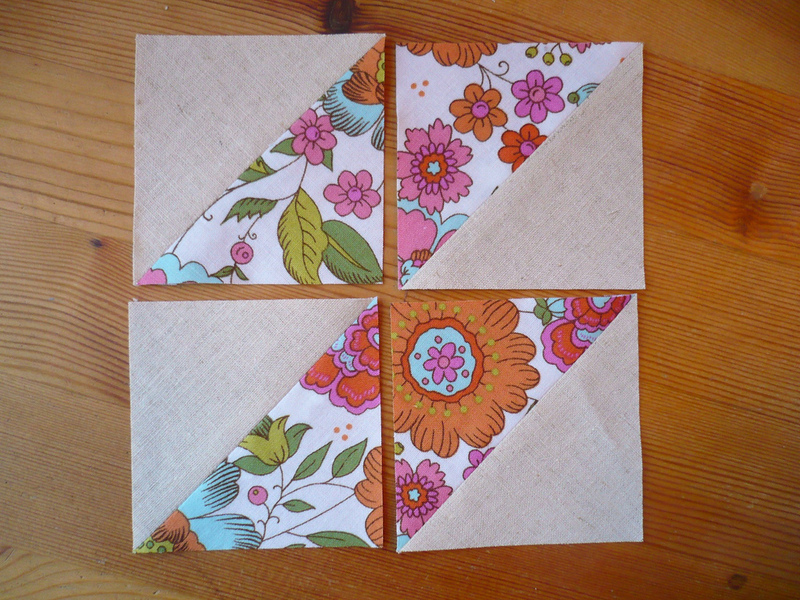 Pair off each charm square with one 5" square of Essex. 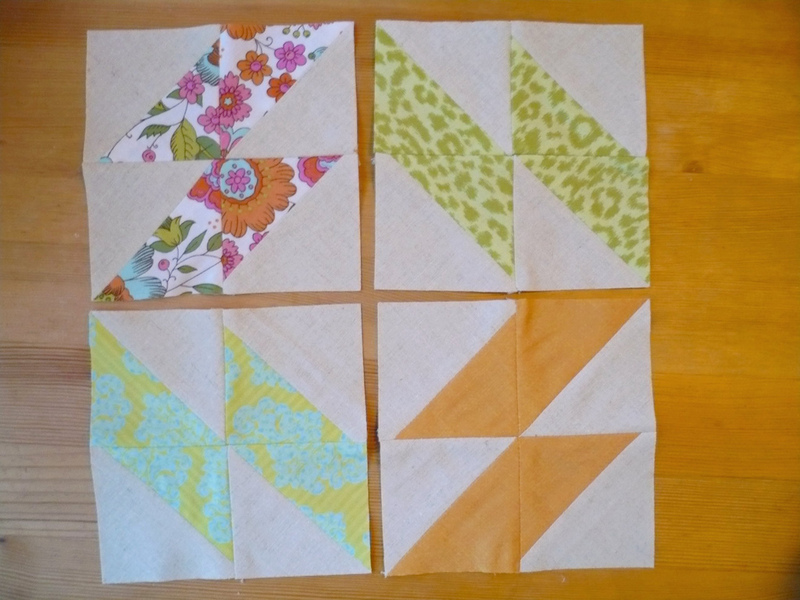 Repeat the following directions for each of these pairs. Place your two squares right sides together. 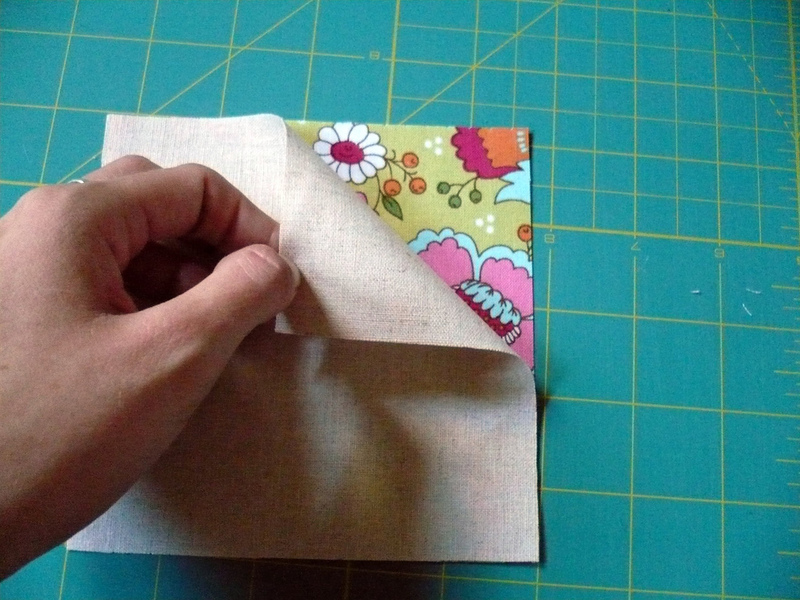 Sew a quarter inch seam around all four sides. 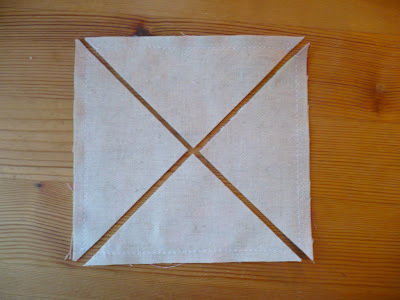 Slice the square twice diagonally so that your end up with four triangles. 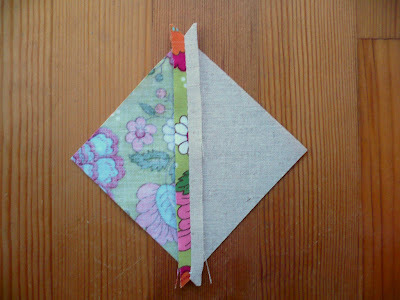 Press your seams flat and trim every HST down to 3" square being sure to cut off the little ears as you go. 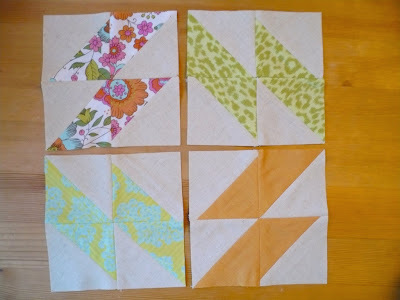 Lay out your HSTs as shown in the picture above. Work with matching pieces one set at a time. Repeat the following directions for all sets. Sew side-by-side squares together right sides together and press. Sew centre seam right sides together and press to form your final square. Select the top four sewn-up sets from you centre panel. Sew side-by-side sets, right sides together and press. 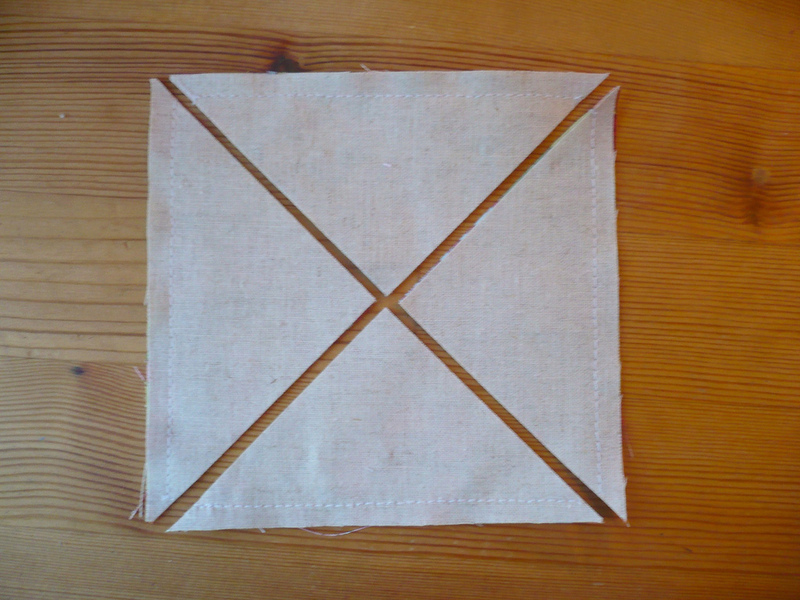 Sew the centre seam, right sides together and press. 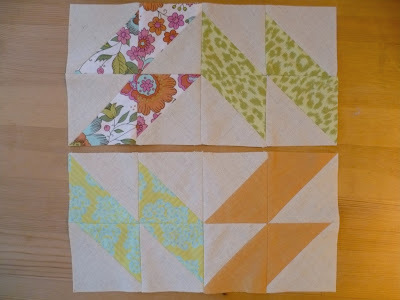 Repeat the above steps for the second grouping of four sets. 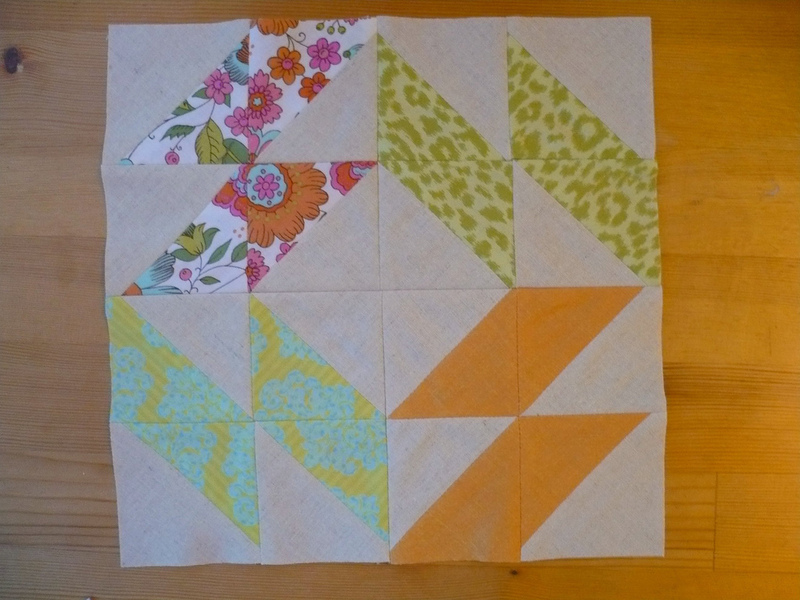 Seam up these two finished squares right sides together and press. 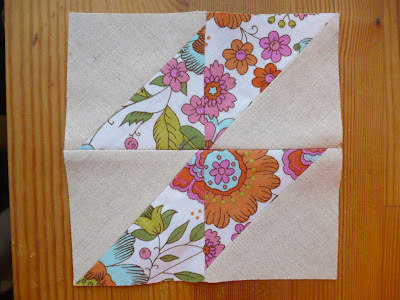 Take the two 3x20.5" strips of Essex that you cut earlier and sew one, right sides together, to each long side of the centre panel. Press. 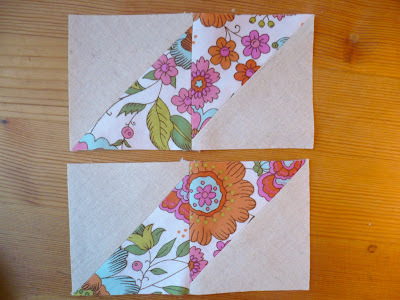 Now take the two 3x15.5" strips that you cut and sew one, right sides together, to each short side of the centre panel. Sandwich, Baste, Quilt, and Bind and you're done!! What do you think? A pretty simple tutorial I know but the colours just make me so happy! Remember that if you make any of my tutorials or patterns that you can add them to the Miss Print Flickr group! From the bottom of my heart I would like to thank everyone for the lovely, thoughtful, and positive comments that were left on my last post! It has been a rough few months in many ways but reading your kind words has bucked me up quite a bit - I know that there are still obstacles and that I just need to keep on working hard but I am feeling better than I was this time last week! 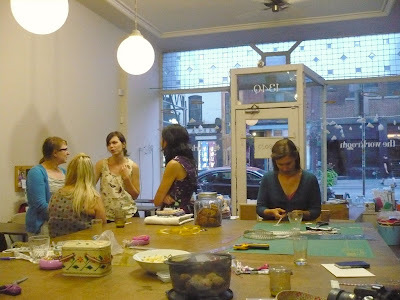 I actually only just realized that both my 200th blog post and three year blogiversary passed in July without any mention or notice from me- whoops! Just goes to show where my mind has been. 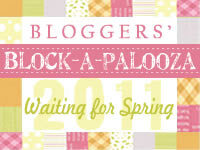 So, um, ya, happy belated 200th post and blogiversary to me! 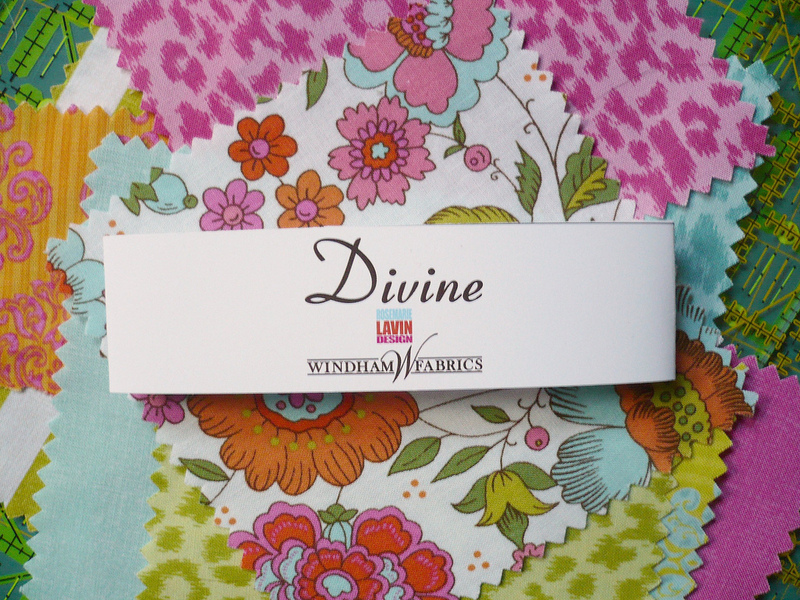 Windham sent over a charm pack with a sampling of Rosemarie Lavin's new collection Divine which will be hitting your local fabric store next month! The colours are super cheery and fun and I am especially loving the florals! 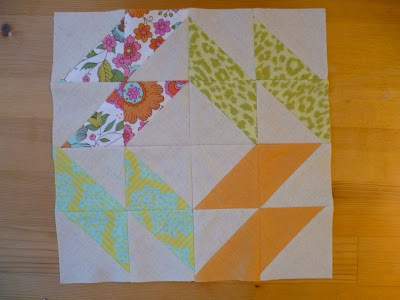 The tutorial that I'm sharing is relatively easy and straightforward but the fabric really makes it pop! Oh and I just have to share with you the "sammiches" that I made for dinner on Friday! I love making sammiches like these in the summer! For these ones I used focaccia bread sliced in half down the middle to create two layers and then I quartered the layers (that makes two sammiches each for Alex and I). 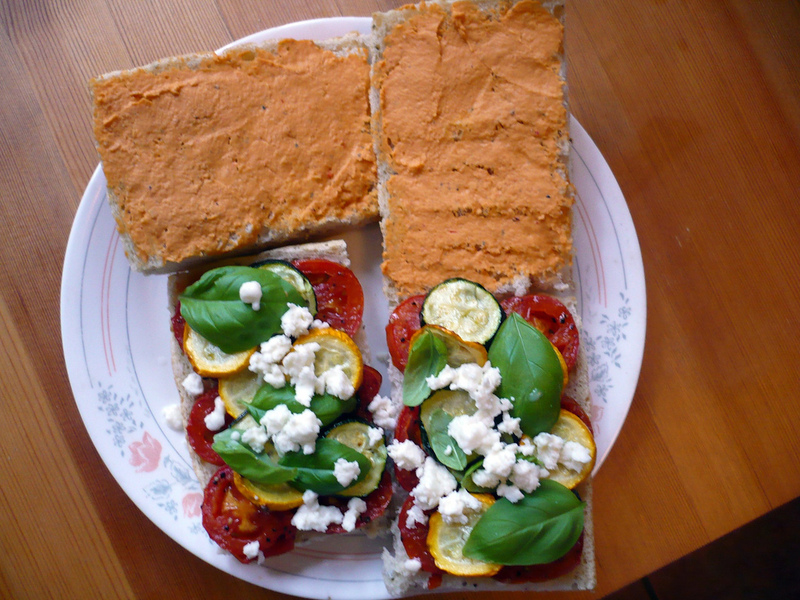 I slathered one half with roasted red pepper hummus and topped the other half with oven roasted tomatoes and zucchini (both green and yellow), fresh basil, and feta cheese! Here's a recipe-lite: I roast the tomatoes and zucchini at home - first I douse them in olive oil and salt and pepper (and sometimes a pinch of sugar for the tomatoes depending on the season) and then pop them into a 400 degree oven for about 20-30 minutes (our oven runs a bit hot and usually the temperature climbs up a bit before these are finished) and then I let them cool for a bit while I warm up the bread (easier for cutting when it comes to hard crusted breads) and assemble the rest of the ingredients. Our oven is a little teeny and I can only fit one pan in at a time so I usually do the tomatoes first so that they can set a bit while the zucchini is roasting. To make the two sammiches I used five average sized plum tomatoes and two average sized zucchini - you can use more or less! Top with whatever you like - I have used different flavours of hummus and dips, goat cheese is great (especially any of the herb flavoured ones), and I've added cooked shredded chicken before - the sky is the limit and really that is one of the best things about sammiches! You could even take these guys and put them in a panini press - or press between two skillets over a burner (poor man's panini press!) - and I'm sure they'd be super tasty! 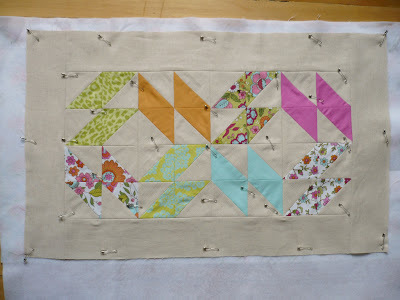 Alright alright, I know that I promised I'd have some finished projects to share with y'all but unfortunately last week, the day after I last blogged, I was injured at work and haven't touched my sewing machine or picked up a needle and thread since. I'm okay but in a freak kind of accident my right arm ended up getting caught between a wall and a truck full of oversize books which not only caused my arm to get jammed up but also bent my right hand backwards leaving me with a sprained wrist (thank goodness it's not broken!!) and since I'm right-handed that has meant that I've been able to accomplish very little this past week. 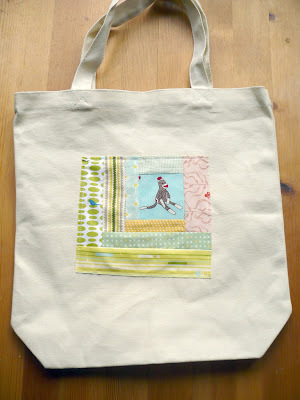 It's feeling much better now, just a bit achy, and I'm going to try using the sewing machine tonight - wish me luck! As a means of giving my wrist a little workout without doing something that requires too much strength or puts too much pressure on my wrist I've been working on a new knitting project since Monday! 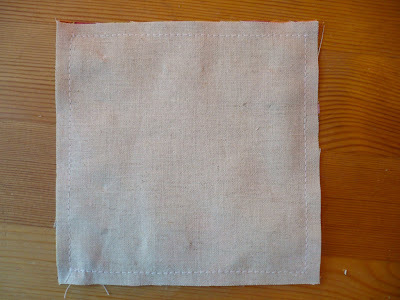 This is the Age of Brass and Steam Kerchief which is a free pattern that I found on Ravelry. 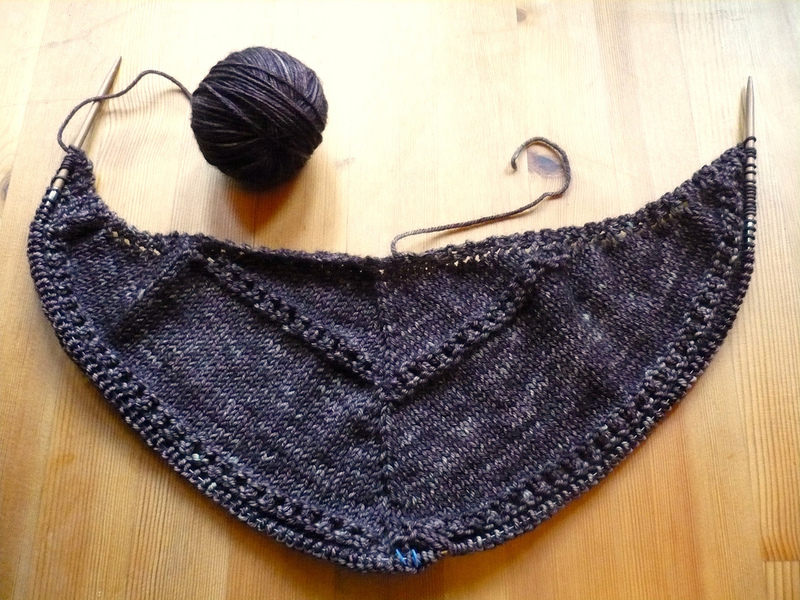 I'm using Madelinetosh Tosh DK in Kale and can not wait for it to be finished! Of course I won't be wearing it now with the weather so warm but I am so looking forward to wearing it in the Fall - Fall is my favourite by the way! The knitting is going much slower than usual with my bum wrist (and let me tell you I am not a fast knitter to begin with) and the purling might just be the death of me, but the pattern is really great and I know that I will wear this all the time once I get the chance! Rav'd here! 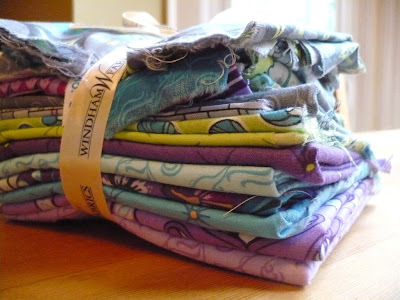 So as a means of smoothing over any waves that I might have created by not sharing a finished project - although I know you all forgive me - I thought I'd host a little giveaway! Not that I really need an excuse to host a giveaway! 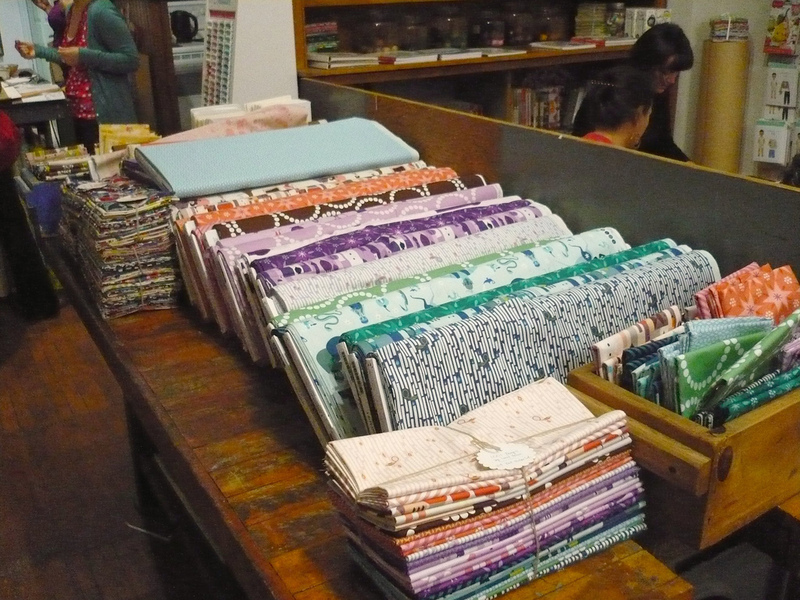 This is Jessica Levitt's new collection Kingdom which was just released on August 1st! 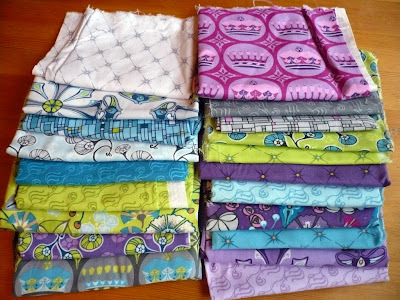 Windham Fabrics sent me this lovely little stack of fabric late last week and I decided to share it with you! In the interest of full disclosure I want to say that yes, Windham did send me this fabric, however they did not ask me to give any of it away on my blog - I came up with that part myself! 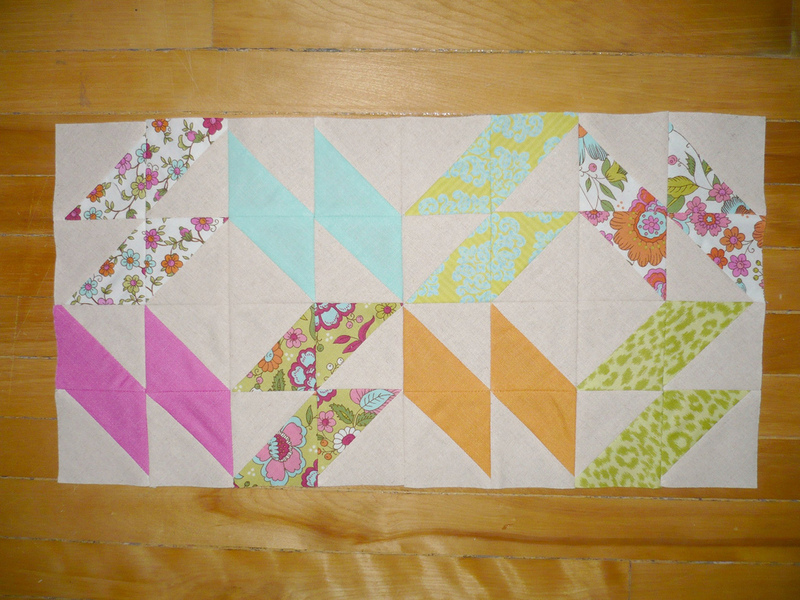 (and if you'd like - tell me which of the colours you like best too)! 2. 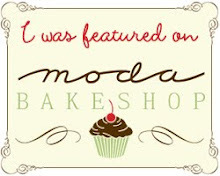 Leave another comment if you are a follower of my blog or if you become one! 3. Leave another comment if you "Like" Miss Print on Facebook! There ya go that's three chances to enter - you do not need to do all of the above but please make sure to leave a separate comment for each entry that you do! Please also remember that all comments are moderated so if your comment does not appear right away it just means that I haven't approved it yet! I will leave the giveaway open until next Wednesday (August 10th). Alright get entering and wish me luck with my wrist and getting back into the sewing mode! Hopefully I'll be better able to show you some finished projects very soon!